Having been a tofu manufacturer for eight years in South Australia gave me some wisdom, crisis, regrets, insanity, good products, sense of success, sense of failure, and now more than twenty years after making my last batch of tofu commercially I still wonder what it was that I was doing. Having been a tofu manufacturer for eight years in South Australia gave me some wisdom, crisis, regrets, insanity, good products, sense of success, sense of failure, and now more than twenty years after making my last batch of tofu commercially I still wonder what it was that I was doing. It was not being a single parent (male single parent at that) in rural Australia as a foreigner (USA citizen) trying to have enough money to survive, fighting in court with a mother who seemed to just like fighting in court, bringing vegetarianism to a meat loving country but there was something enjoyable about the experience. I wrote a tofu cookbook, sold tofu throughout Australia, had dozens of products, even more dreams/illusions than there are soybeans in a 50 kilo bag and somehow managed to stumble through a weird set of years. Well that was the 1980s. 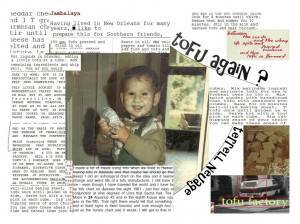 Now in 2011 the only thing left to do is create an ebook about tofu. A combination of recipes, stories of survival (we moved our factory seven times in those eight years from a purpose built factory in the city of Adelaide to finally ending up in a dairy shed on a farm in Mt. Compass), tips on how to make kids think the tofu they are having for dinner could be meat, and some general philosophy. After all I did earn not only a BA, but a Master's Degree, and finally a PhD so I suppose I should have something to philosophize about.